The REVO America RCBS30-2 Super High Resolution Camera is able to produce clear and crisp images. It has a metal casing which helps it to stay durable even in bad weather conditions. This camera can be used indoors as well as out, there is a mounting bracket included with it which will allow you to mount the camera anywhere outside. This camera also has an in built microphone which means that you can not only record high quality footage, but you can also record audio to go along with these. With built-in IR LED's, these allow the camera to record up to 80 feet even in total darkness. 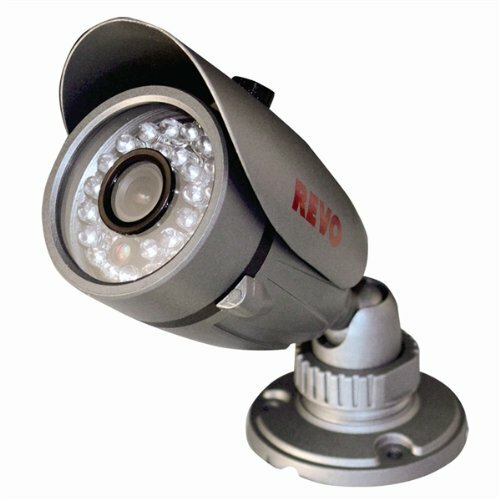 This camera works well with other REVO cameras you may already installed in your house. This camera is capable of producing color footage in high resolution, which is great for anyone looking to have a color camera recording. The overall power consumption of this unit is very low, even with the IR LED's in use it will only draw 4 watts of power. The IR LED's installed into this camera have a lighting distance of just under 80 feet which still gives great footage even in low light conditions. Super high resolution color footage, meaning you can see a clear and crisp image. Built in microphone, allows for audio to be recorded, which is ideal for indoor recordings. Low power consumption at 4 watts. Requires a lot of time to get it setup and working from out of the box. Swivel arm which connects the body and base is made from plastic. Fairly Expensive when installation costs are taken into consideration. We feel that this camera produces high quality video and audio footage, which makes it ideal for both indoor and outdoor use. If you are looking for a camera which can record in color then this is definitely the right choice for you. With the ability to have record even in darkness, this camera is an all round surveillance system ideal for any home or office space.If you are looking for an all round camera which works well in any situation then this is definitely the one for you.